Chips of sticky bark scattered on the snow. Hod wrenched his axe from the fir trunk, hoisted it. His shoulders knotted, lifted under furs and wool. Steel bit deep again into white wood. Hod levered the axe away, swung again. He huffed and puffed, breathed deep the winter air. A musk of pine and frozen soil sat dull on his palette. Steaming breath rose from the woodsman, filtered through snowflakes and waving needles. A rhythmic, hollow clop of steel on tree echoed in the silent wood. Wedges, bleeding sap, dropped to the snow. Hod shifted his blistered grip on the haft, circled to the reverse of the trunk. He began again. Hod slammed his blade into the fir, widened a triangle in its flesh. Frost shone like flat spiderwebs on the chilly wedge of steel, glimmered under the setting winter sun. Hod grunted, grit his teeth. The fir quaked with every strike. With a long, corky whine, the trunk began to tip. Hod hopped away, watched his handiwork tumble. There was a slow series of cracks; a quick, snapping crash. Snow burst about the toppled bole, began to settle. Hod huffed, surveyed his work. Ice slipped, spattered to the forest floor from broken branches. With a few rustlings and clicks of glassy debris, the wood was silent once again. Hod stretched, rolled his shoulders, groaned. From some nearby hilltop, a cry went up: A long, high rattle, like teeth dropped down a washboard. Hod froze. The woodsman hunched his shoulders, scanned the trees with wide eyes. Branches shifted, not far away. A ripple of motion bled through the trees, barely there. Another rattling caterwaul sounded, terribly close. It was dry and piercing; a sound made in no throat imaginable. Hod squeezed the haft of his axe, watched the shadowed spaces beneath pines' branches. Something shifted there. Something with rustling, furred legs and shining eyes. Hod saw it scuttle in the dark, silent on the crunchy snow. Slowly, it emerged, clicking throatily. One leg poked from the dark, set a hoof-like print in the snow. Seven more undulated, rippled from the branches, conveying a low, hunched body. 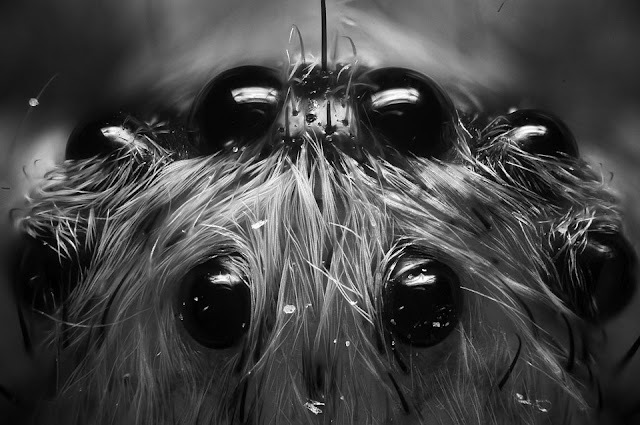 Mandibles hung close to the ground, twitched neath a cluster of roe-eyes set in fur. The arachnid stared at Hod, worried its sickle-jaws. It stamped with thick, hairy limbs, gouged the snow. Hod widened his stance, locked his two eyes with the creature's many orbs. He held his axe high, stamped with one foot. In response, the spider jerked at him, clicking. A snort of air kicked up snow, huffed by the thing's heaving breath. Slowly, Hod approached the beast. He whipped the axe to and fro, watched steel flash, duplicated, in eight glaring mirrors. He grumbled, croaked deep in his throat, matched his adversary's breathless clicking. The beast widened its serrated fangs, crouched even lower. In an instant, it leapt. Eight hairy feet threw up gouts of frozen soil. The beast crashed inches before the woodsman. Jaws twitched before his legs, wide and sharp as logging tongs. Long front legs hung over his head, lined with black hooks. Hod merely twitched an eye, blinked away snow. The spider clacked its jaws, huffed again, ceased its clicking. It lowered its legs, ruffled its brindled fur. Slowly, almost calmly, it hiked itself up, turned its abdomen under elevated legs. A dollop of stringy goo landed on Hod's boots. The thing turned on the spot, scuttled back into the darkened fir boughs. Hod didn't watch it go. 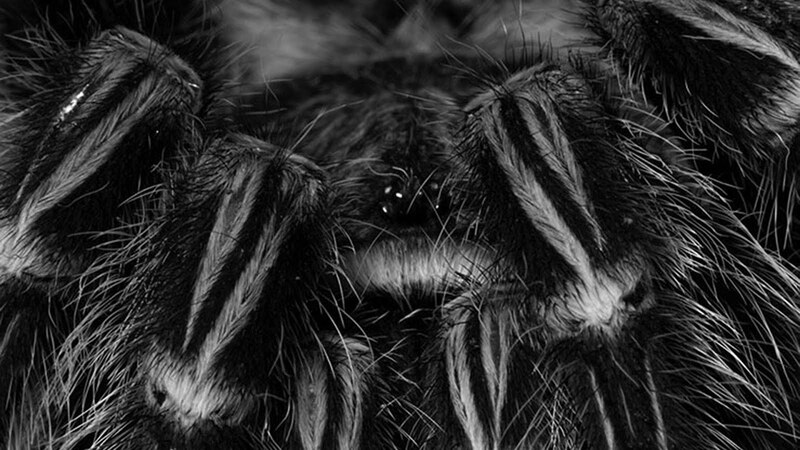 He loosed a long-held breath, made swiftly away from the valley of the wolf spider. "You hear that?" said the old man, turning his ear to the shadowed trees. Firelight wavered in the fleshy grooves of his wrinkled jowls. A hollow clicking echoed in the snowy foothills. Powell cocked her hooded head, listened. "Woodpecker?" she said, prodded the campfire with a stick. The old man grinned, showed a distinct lack of teeth. He chuckled wetly. "No bird. Never been this far south, Ranger?" "That's the howl of die wolfsspinne," said the man. He coughed briefly, spat into the fire. "Wolf spider." Another howl went up, replying to the first. It was distant, nearly lost in the crackle of the fire. Powell smirked. "Don't suppose they're itty-bitty little spiders, are they?" "No, Ranger. Worse. Much worse." "Come on. It sounds like there's only a few," said Powell. "Aye, but that how it is," said the old fellow, shifting on the his stump. His jowls wobbled, liquid. Powell made a face. "Don't roll yer eyes, lass. These beasts hunt alone. Jaws like sickles. Larger than wolves, they are, and silent. Only howl to mark their territory." "Aye," said the man. He coughed, wheezing. "Dead quiet. Could be one here now, at the light's edge. We'd never know." Powell tossed her stick in the fire, looked to her tent. "Think I might turn in. Lot of walking, tomorrow," she said, rising. "Thanks for being such an entertaining guide." "I'd not take such a lighthearted tone if I were you, lass. It's the small ones they go for, and you're just about the right size for a bite." Powell made a derisive snort, ducked under the canvas. She yanked off her belt and boots, tucked her cloak about her, settled into the near-silent night. Her guide's wet coughing carried on for a while, before turning to damp, low snores, and, eventually, silence. Come dawn, Powell stumbled from her tent, rubbing hair from her eyes. Her breath hung in the winter air. "Brown," she said, called the guide's name. "Why's the fire out?" "Brow-" she started, choked. By the firepit slumped a husk. Powell, wide-eyed, turned it with a toe. Bones and gristle slid from a lacerated shell of cloth and leathery skin. Skin, pierced at the neck by jaws like sickles. 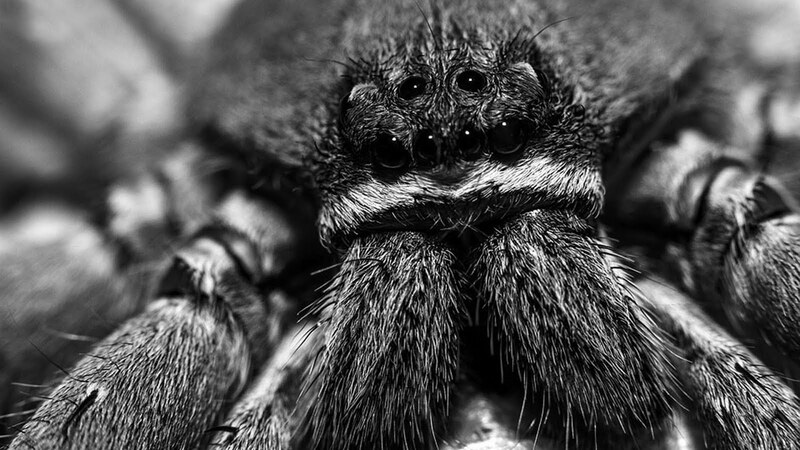 The name "wolf spider" is a dreadful misnomer. A wolf is a social, cooperative creature which hunts in packs. A wolf spider hunts alone. It is as antisocial as creatures come. A wolf is a threat, but it fears humans. While it may eat your fleeces or your grandmother, it won't do so unless the deer have all gone. A wolf spider is a terror without fear. It will eat your grandmother because she's fattier than a deer, and it will eat her cats, too. A wolf howls to rally its kin, to bond, to celebrate the birth of new pups. The wolf spider howls because it wants you off its territory and it's going to come and fight you if you don't shove off. These terrific arachnids are at home in the tree-clad foothills of the Coast's central interior. There, they stalk the rolling pines in utter silence, dwell in deep, glacial caves. The territory of a wolf spider may encompass a small mountain valley. This hunting ground will feature a high place (a treed hill, an old tower, a cliff) where the spider watches its domain. Here, the beast squats, observes. It watches with keen eyes for intruders and prey. The former will be challenged with a rattling shriek. The latter will be noted for later gobbling. Wolf spiders are possessed of terrible fangs (frequently compared to grain sickles.) With these mandibular instruments, they catch and crush prey, relying on the force of a single bite to sever vertebrae or induce shock. Slain prey are pumped full of a liquefaction agent, reducing the subject to a nutrient slurry. This goop is gobbled straight away. Notably, wolf spiders spin no webs. The small spinnerets they possess serve as a mode of marking territory with pheromone-laden goo. This goo, spied on the sides of trees or rocks, may indicate that a walker in the hills has entered spider territory. Inhabitants of the mainland see no use in being friendly with the little beasts. Their larger cousins bring terror to the countryside with rattling, territorial screams. *This is a tricky thing to do, as they are loth to attack without surprise on their side. **They somewhat less treasured for their habit of eating children and mice.